A fly mask is a mask used on horses to protect the face from flies and other insects. Depending on the style of the fly mask, it might cover just the face, or also the ears and/or nose. 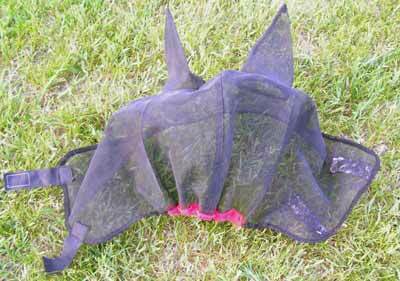 For many owners fly masks have become a staple for use on their horses during the fly season. Below are fly masks for horses for sale on Amazon and eBay. There is usually an excellent selection of types and styles. Fly masks are usually made of mesh that allows the horse to see through it. If the ears are covered, the horse can also hear as well. Some fly masks also provide protection from the UV rays of the sun. 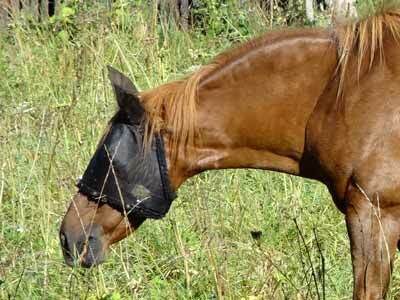 Please scroll down for a few good things to know before buying a horse fly mask. You might also like horse fly sheets. 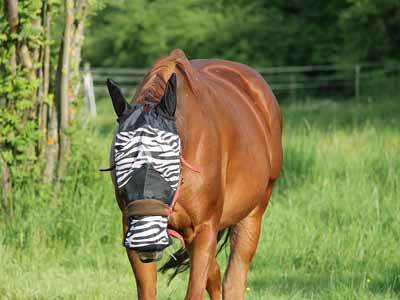 Below: A horse wearing a fly mask with a zebra design. This particular mask has ear and nose protection. Quiet Ride horse fly mask - no ears or nose. From Amazon. Fly masks come in different styles with different features. Below is a checklist of common styles or features commonly found in fly masks for you to think about. What type of fly mask is it? Some fly masks are a "fringe" style which means they have a strip of long fringe that can be attached to bridles, halters, etc. This style of fly mask acts a lot like an extra-long forelock. Other styles of fly masks are a type of mesh material that covers the horse from above the eyes to about halfway down the nose, or even all the way down the nose. This style may or may not also cover the horse's ears. What size is the fly mask? While fringe styles usually don't come is sizes other styles usually do. The sizes are commonly a bit generic (horse size, pony size, miniature size, etc.) because most fly masks are adjustable. However, some manufacturer's sizes are more specific (small, large, etc.). What color(s) is the fly mask? If it's important your horse is fashionable or color coordinated you'll want to shop for just the right color. Below: A black mesh fly mask with hook-and-loop closures that also covers the ears. Is the fly mask made to break away easily without hurting the horse or causing damage to the mask? What type of closures does the fly mask have? While most of them have some type of hook-and-loop closure, a few styles have zippers or other types of closures. Does the mask have padding around the edges? If so, what type of padding is it? Some padding is fleece, or some other "fluffy" type of material, while other padding has a lower nap so as not to attract as much dirt, grass, stickers, etc. Does the fly mask offer UV protection? Do you want it to? Does the fly mask cover the ears? Do you want it to? Do you want the fly mask to be extra long so as to cover the nose? If so, does it also offer UV protection to help prevent sensitive noses from sunburn? Do you want a fly mask made specifically for riding? Fly masks that are made for riding usually have a lighter, more see-through type mesh over the eyes that offers clearer vision than heavier meshes. Below: A fly mask with ear protection and padding around the edges.